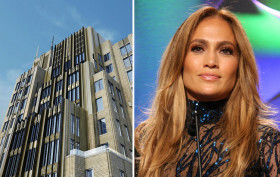 Is Jennifer Lopez Moving Into Chelsea’s Walker Tower? Jenny from the Block could be looking to move to Chelsea’s Walker Tower. According to the NYP, Jennifer Lopez was spotted scoping out apartments alongside celebrity broker Fredrik Eklund. The pair reportedly checked out an unlisted apartment and eyed the floor plans of several other units over lunch. The Post notes that J Lo’s budget is around $20 million. With that in mind, might we suggest the building’s $25M duplex penthouse?